Welcome our new fashion writer Carli! Remember to join us tonight for Redbook Happy Hour Twitter party about girlfriends and parties! 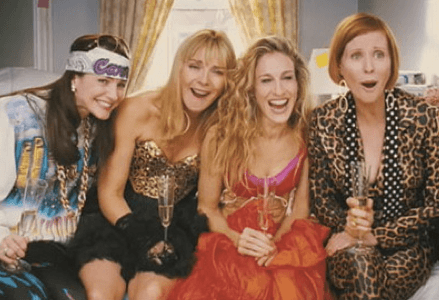 The great (yet fictional) Carrie Bradshaw once said, “If you are single there is always one thing you should take out with you on a Saturday night, your friends. “ Now whether you are single or not, I believe that a Saturday night with your girlfriends is a necessity. A night with your girls is the perfect time to gossip, vent, bond, and most importantly sport some fabulous clothes. Now that it is summer, days are longer and nights are warmer. Summertime is the perfect time to have a girls-only get together. With various options ranging from an outdoor soiree to an indoor movie night, the choices are endless. But of course with the different types of girls’ nights comes different outfit choices to suit each occasion. While the most important thing about a girls’ night is the great company of your friends, why not try to wear something a little daring or more trendy than you normally would? Perhaps something you wouldn’t normally feel comfortable dressed in? One advantage of a girls’ night is that you feel at ease around your girlfriends so you can take more of a fashion risk without feeling awkward about it. Before you try out this trendy piece in public, test it on your girlfriends first at girls’ night and ask for their opinion. The friends you’re with aren’t going to judge you, so why not try something a little more fashion forward than usual? For example, you might not normally wear this dramatically draped and embellished top however; wearing it first around your friends will give you the confidence to wear it again. This outfit is appropriate for pretty much any type of girls’ night in. For a girls only movie night I know it is tempting to just reach for your favorite sweatshirt while curling up on a comfy couch with your friends. While I am guilty of this habit I realize that there are so many equally comfy yet way more fashionable options available. Although black leggings are not the most stylish article of clothing out there, they are definitely an upgrade from my favorite college sweatpants I would like to be wearing. Pairing simple black leggings with a slouchy yet embellished sweater dresses up this casual outfit while still keeping it comfortable and practical for a night on the couch. On the opposite end of the spectrum, a girls’ night could be a little more fancy with appetizers and drinks. In this case, the scene is a little more formal without going totally overboard. When you’re with your friends you want to be comfortable and have a good time yet look pulled together which is why a casual dress is perfect for this occasion. Anything too extravagant may look like you’re trying too hard to impress (remember its just your girlfriends!) so I would suggest something that you feel suits you. I chose this purple tie-waist dress because it can be dressed up or down and has a universally flattering cut. The jeweled shoes dress this outfit up a little bit but the fact that they are flat sandals still keeps this look casual. With the addition of silver jewelry and a quilted black bag, this outfit is complete for a more dressed up girls’ night in. But no matter what you wear, remember the most important thing about a girls’ night in is to be yourself and enjoy the time with your girlfriends. Your friends are your friends no matter what you wear therefore don’t be scared to try something outrageous. So whether you’re watching movies or sipping cocktails, remember that a girls’ night in can be just as fashionable and fun as a girls’ night out. Join us for #REDBOOKhh Twitter party tonight at 8-9PM EST to talk more about girlfriends and girls nite in! Follow @redbookmag and @skimbaco for details and to win prizes. Written by Carli Halper. 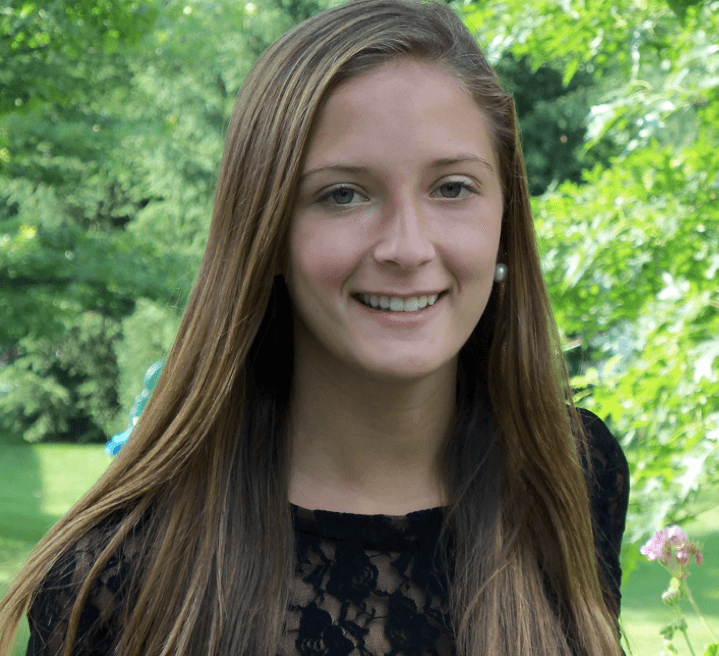 Carli Halper is currently a college student studying at the University of Delaware. She is majoring in communications and is a member of the National Society of Collegiate Scholars. She likes to think of herself as the average college girl that loves to shop. Her other interests include the beach, reading, and spending time with family and friends. Awesome picks – Love the pink ballet flats!